Boston Public Garden, in the midst of the bustling city of Boston, is a peaceful oasis. You may have grown up with the children's story Make Way for Ducklings, by Robert McCluskey, and if so you'll remember the pond where the duck family made their home. This centrally located pond is transversed by a lovely bridge that is the main feature of this park. As you cross the bridge, you will see the famous Swan Boats that drift along the pond, followed by families of ducks and geese who make the Public Garden their home. Boston's Public Garden is the oldest public botanical garden in the United States. Boston Commons, which was created two centuries earlier in 1634, was created as a space for local people to graze their cows. It was a practical space with pathways through which people could cross town. The Public Garden, on the other hand, was created during Victorian times, and its purpose was much different. Horace Gray, a local philanthropist, petitioned the city to create the nation's first botanical garden on land Boston City Council intended to sell. George Meacham, who designed the Public Garden, included rare and colorful hybrid plants and imported trees. The Garden is surrounded with a wrought iron fence and it includes statues and fountains. Boston's Parks and Recreation Department continues to supply the Garden with plants and flowers grown in its greenhouses. Over 80 different species are nurtured in these greenhouses and later planted in the flower beds at this and several other parks in town. The Public Garden is 24 acres and was built in 1837. The land was once a salt marsh but was later filled and then allocated as park land for establishing America's first botanical garden. Have You Ever Visited Boston Public Garden? one bucket list item I have. I have been to Boston many times as a child vacationing at my grandparents who lived in the suburbs of Boston, so am sure I have been here. One of the park's main features is the suspension bridge that crosses the lagoon. When the bridge was built in 1867, it could have been called the world's smallest suspension bridge. Since then, however, reinforcements have been added underneath to help support it, and so it can no longer be technically classified as a "suspension bridge" as the cables are now merely decorative. Still, it is a thing of beauty. The bridge is featured on this T-shirt from Zazzle. 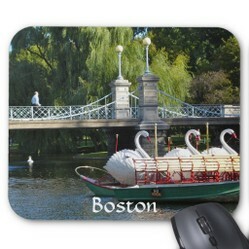 It can be found on several other Zazzle products, as well, including iphone cases, post cards, and mouse pads. In the middle of the Gardens sits a pond, often called the Lagoon or the Duck Pond. If you are standing by it, you can hardly miss the famous Swan Boats in operation since the 1870's. Robert Paget adapted a catamaran to be powered by bicycle to propel him around the lagoon. He decided to cover the operator's seat with the image of a swam. He was inspired by the opera Lohengrin in which the knight crosses a river with the help of a swan to defend his lady love, Princess Ella. Although the boats are now larger than his original, the basic idea of offering rides on a swan boat has been continued over the years. Now, four generations later, the Paget family is still operating the Swan Boats in Boston. Make Way for Ducklings, the famous children's book written by Robert McCluskey in 1941, tells the story of Mr. and Mrs. Mallard who are looking for a place to raise their young. They build their nest on the banks of the Charles River, but after her babies are hatched, Mrs. Mallard leads them back to the Public Garden where Mr. Mallard awaits them. With a little bit of help from Michael, the friendly policeman, they cross the heavy traffic to get there. The bronze statue, located at the park entrance near the corner of Charles Street and Beacon Street, was designed by Boston sculptor Nancy Schön. It shows Mrs. Mallard and her baby ducklings manoeuvring the streets of Boston looking for a home. The duck family statue has become one of the most popular statues in the park. Many families have visited it since its installment in 1987. Have You Read Make Way for Ducklings? I read it when I was a whipper snapper. I will be sure to look for the bronze statue if I ever get to Boston in warm weather. The Duckling statue is not the only famous statue in the Public Garden. The Arlington Street entrance is dominated by the large bronze statue of George Washington on horseback, which was sculpted by Thomas Ball in 1869. This statue of the United States' Revolutionary War hero and first president is considered one of the best equestrian statues in the US. Among other notable statues is John Quincy Adams Ward's Good Samaritan and a child, which commemorates the introduction of anesthesia for surgery. The first successful use of ether as an anesthetic was in 1846 at the nearby Massachusetts General Hospital. This statue, near the corner of Arlington Street and Beacon Street, is a tribute to that event. Several other statues appear in the Gardens, as well. A few of them depict children, while others commemorate famous people of Boston. In all there are 750 trees and shrubs in the Garden, including 125 different tree varieties. The weeping willows, as shown on this magnet, are graceful and dramatic. Several varieties of elm, oaks, and maples, a horse chestnut, tulip trees, redwood tress, and many others line the curving walkways along the pond. There are also rosebushes and several flowerbeds that are carefully maintained. Boston Public Garden is located across Charles Street from Boston Common. Together they are often called the Jewel of Boston's Emerald Necklace, a series of parks and green spaces designed by Frederick Law Olmsted, the first landscape architect in America. The Emerald Necklace is seven miles long and can be crossed on foot or by bicycle. Beginning at the Boston Common, the string of parks curves through Boston, ending at Franklin Park. Any visit to Boston should include walking along this green area, as it is a breath of fresh air in the middle of the city. If you cannot walk the whole distance, I recommend that you at least visit the Public Garden. Thank you for this review of this Boston park. I want to see the city and the surrounding area some year soon. @happynutritionist I wonder whether we crossed paths in those days. Maybe you were sitting beside me on the swan boats. Thank you for bringing back memories from my childhood of times spent with my grandparents in the suburbs of Boston, and our visits to Boston. That was in the story Make Way for Ducklings, WriterArtist. It's a sweet story about the duck family. The Boston public garden has an interesting story attached to it. I think, I read once in the newspaper about the ducks crossing the road and the entire traffic stop for them to pass it. Perhaps it is a real fact and not a story at all. There are so many high caliber colleges and universities in Boston. I only realized how rare that is after I had moved away. Maybe next time you'll see the Public Garden. It's in the center of the city. I'm glad you've enjoyed the virtual tour, Veronica. How lovely to read this and see the swan ride pictures. Ty, I didn't know any of this. Living in the UK, it is delightful to see articles like this which give glimpses of other places in the world. "Jewel of Boston's Emerald Necklace" what a beautiful image. so quaint. I've been to Boston, but only to attend a graduation ceremony. Wish there had been time to see some other things there, like the gardens, which you have so beautifully described. I've never heard that quote, DerdriuMarriner. There certainly are some fascinating places in the city. Do you remember the jump rope songs from your childhood?Jump rope songs have a natural rhythm and sometimes zany meanings.They pass from kid to kid.Now Double Dutch wows the world!